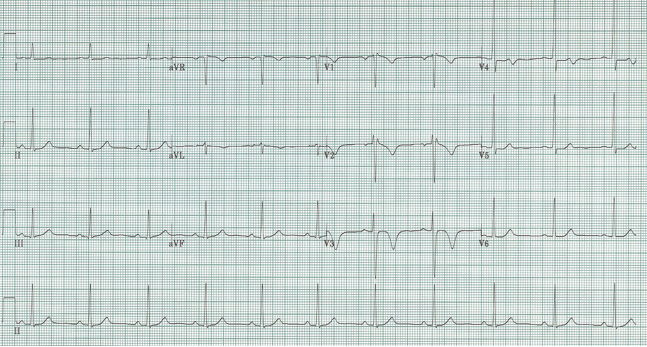 What is the diagnosis associated with this EKG? but notice that the R-wave progression of the chest leads is normal when just limb leads are switched. This challenging EKG is from a patient with dextrocardia. It is advisable to place the chest leads in the right-sided array to get an improved diagnosis of ischemia and infarct patterns. 56-year-old woman with prior chest pain six hours ago. Patient was pain free at the time of this EKG. 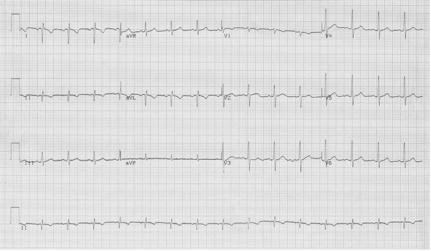 The most striking finding on this EKG is the deep T-wave inversions in V2-3 and the biphasic T wave in V4. She was pain-free at presentation and an initial troponin was negative. Three hours later the repeat EKG was unchanged and a second troponin was minimally elevated at 0.12. She was heparinized and admitted to telemetry. She went to cardiac cath the next morning – that revealed 90% proximal LAD stenosis that was successfully stented. Since these anterior T-wave inversions appeared in the pain-free interval following her chest pain episode, I believe they represent Wellens’ syndrome. Wellens’ may present with biphasic T-waves in the anterior leads or with deeply inverted T-waves in the same leads (original reports actually claimed deep T-wave inversion were the more common finding). We can add this form of Wellens’ to the differential list of deeply inverted T waves (remember: spasm, Takotsubo, CNS event, and rarely PE). Wellens noted that unstable angina with this EKG pattern frequently (75% of his patient series) developed an extensive anterior MI with days to weeks of presentation. This finding correlates with angiography in the modern era that typically demonstrates a critical lesion in the proximal LAD. Rhinehardt J, Brady WJ, Perron AD, et al. Electrocardiographic manifestations of Wellens’ Syndrome. Am J Emerg Med 20:638-643, 2002. Tandy TK, Bottomy DP, Lewis JG. Wellens’ Syndrome. Ann Emerg Med 33:347-351, 1999. 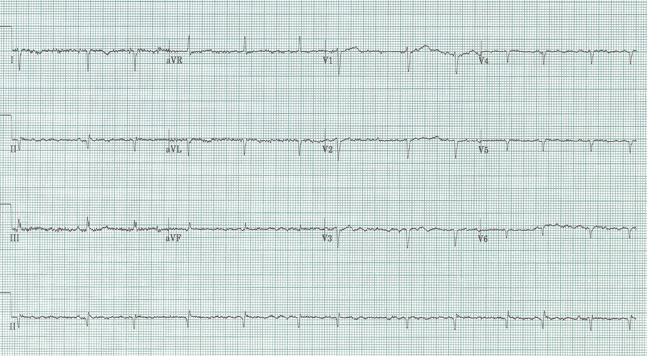 Nursing are concerned about this rhythm in a chest pain patient. There are several reasons to be reassuring about this rhythm. There is something regular occurring throughout the rhythm strip – in this case, there is some remnant of the sinus beat (as marked above). Also note that the O2 pleth continues undisturbed throughout the period of the questionable arrhythmia. This is a good example of artifact simulating ventricular tachycardia. This rhythm strip is slightly more difficult to define because the O2 pleth has some artifact throughout the strip. However if you use calipers or mark R-R on a piece of paper you will again find remnants of persistent sinus rhythm through the apparent ventricular tachycardia…artifact NOT ventricular arrhythmia.